Since the obsession with cooking started, I’m starting to discover how terribly easy it is to recreate flavours of Singaporean/Malaysian dishes with instant food packages. Mr. P and I had already experimented with kangkung belachan, tom kha kai and buffalo wings, while last weekend saw me cooking up nasi goreng (Indonesian fried rice) with the aid of a ready-made paste, saving me the trouble of hunting for belachan (Malay shrimp paste). To make nasi goreng as close to as what I remember, I added julienned red chillies, fried scallions, thin omelette strips and shrimps to stir-fry with the rice. (Do remember to pre-cook rice and let it stand overnight or at least a few hours to dry it out.) I then garnished the dish with more scallions, spring onions and cilantro leaves, and included sliced cucumbers and chopped chillies in soya sauce on the side. By the time the fried rice was cooked and placed on a plate, a lovely fragrance wafted across the room. 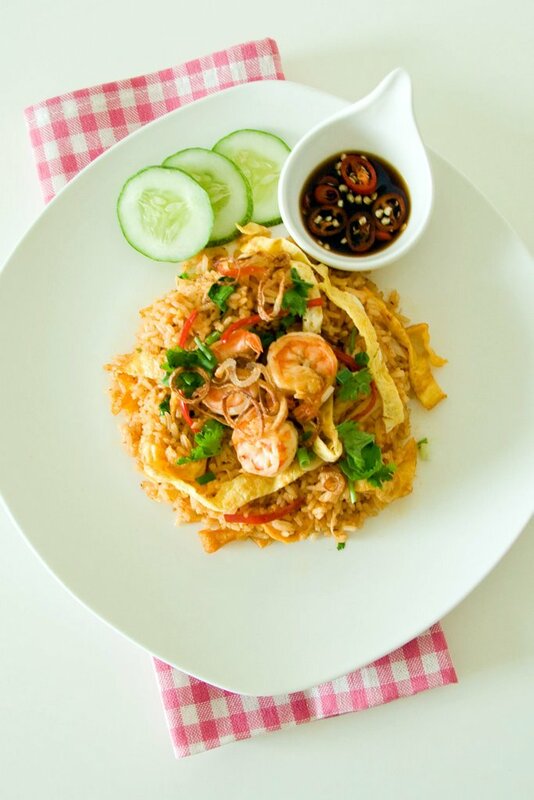 When I shove a spoonful of nasi goreng into my mouth, it made me, for a moment, crave soooo much for Singaporean food. It felt so good to savour such a familiar taste; although fried rice dishes are very common in Thailand, but my self-made nasi goreng hit the spot even much. Mr. P enjoyed the Malay-style fried rice so much that he requested for me to make it again soon. Seems like I need to trouble Singaporean friends who are popping by soon! Since I didn’t make nasi goreng from scratch, I don’t feel qualified to share my recipe. For a proper recipe, check out Rasa Malaysia’s version. 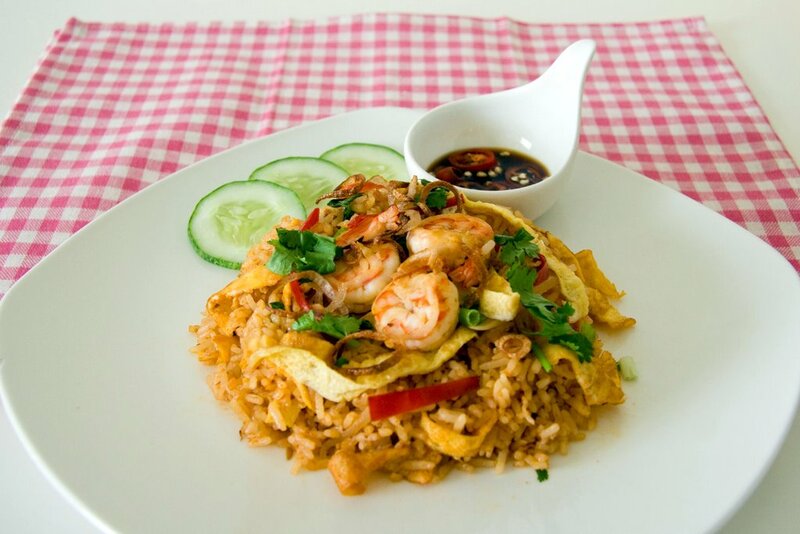 This entry was tagged belachan, Indonesian fried rice, kecap manis, Malay fried rice, nasi goreng, Singapore fried rice. Bookmark the permalink. Yeah sauce packs are lifesavers, no matter how busy we are!